BlackBerry and Amazon really have little to do with each other as far as their core businesses are concerned. One is a struggling smartphone maker whose entire turnaround is pinned on the recent launch of its BlackBerry 10 platform. The other is an e-tail giant with a tendency to disrupt everything it touches. The extent of their overlap is that both companies sell mobile gadgets -- BlackBerry sells smartphones and Amazon sells tablets. Investors can now add another similarity to that short list: BlackBerry is being coy with its unit figures. The new BlackBerry Z10 has gone on sale in the U.K. and Canada, two of its most important geographical segments. The U.S. launch will have to wait until March as carrier partners finish up testing the device before it can be cleared for sale. 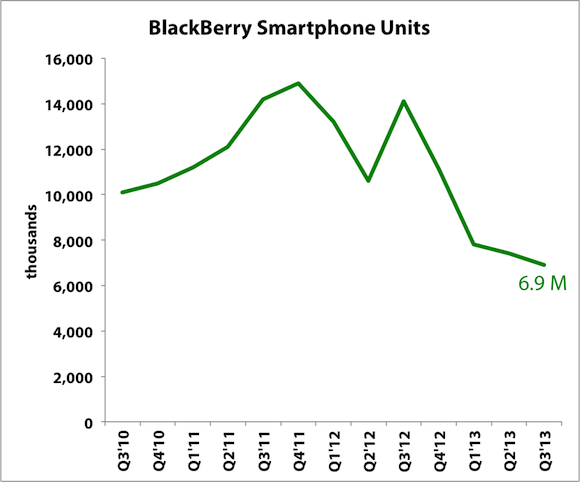 Initial indications are that the Z10 is off to a strong start with pent-up demand clearing out available supply. What investors won't find in there is actual unit sales data. No one outside of Waterloo has any idea how many units the company has sold on a launch day in Canada or how many BlackBerry units was the record for a first week of sales. That's just like how investors have no official clue on how many Kindle units Amazon had sold when it said this a year ago: "During the nine-week holiday period ending December 31, 2011, Kindle unit sales, including both the Kindle Fire and e-reader devices, increased 177% over the same period last year." Of course a 177% jump sounds nice, but investors really want some more context since growth off a small base can be misleading. These figures are both specifically vague and vaguely specific at the same time. I wonder what it would be like if Thorsten Heins and Jeff Bezos tried to see who could eat more spring rolls. These aren't the only two tech companies to play unit figures close to the chest. Google doesn't disclose unit figures of its Nexus devices. Motorola used to but that all stopped once it was swallowed by Big G. That's particularly frustrating since Googorola is a heavyweight in mobile and its Nexus gadgets are rather popular. Microsoft also opted not to tell investors how many Surface RT tablets it sold during the fourth quarter, which was on sale for just over two months during that time frame. Steve Ballmer initially conceded the tablet was off to a "modest start" due to limited distribution channels. As far as some of these mystery digits go, investors must turn to third-party estimates to get their fix. Market researcher IDC estimates that Amazon sold 6 million tablets in the fourth quarter. The researcher also estimates that Asus shipped 3.1 million tablets, which would have mostly been Nexus 7 devices. Some Android enthusiasts have tried to decode IMEI numbers on LG-built Nexus 4 smartphones to estimate that Big G only moved 370,000 units last quarter. Surface channel shipments were in the ballpark of 900,000, according to IDC's estimates. In fairness, BlackBerry does disclose unit sales data when it announces quarterly earnings. The company just isn't sharing these Canada and U.K. launch figures. Source: BlackBerry. Fiscal quarters shown. BlackBerry will need to eventually tell investors how the Z10 is doing so they can judge for themselves how this turnaround is proceeding. Everyone knows Amazon is the big, bad wolf in the retail world right now, but at its sky-high valuation, most investors are worried it's due for a correction. We'll tell you what's driving the company's growth, and fill you in on reasons to buy and reasons to sell Amazon in our new premium report. Our report also has you covered with a full year of free analyst updates to keep you informed as the company's story changes, so click here now to read more. The article BlackBerry Pulls an Amazon originally appeared on Fool.com. Fool contributor Evan Niu, CFA, has no position in any stocks mentioned. The Motley Fool recommends Amazon.com and Google. The Motley Fool owns shares of Amazon.com, Google, and Microsoft. Try any of our Foolish newsletter services free for 30 days. We Fools may not all hold the same opinions, but we all believe that considering a diverse range of insights makes us better investors. The Motley Fool has a disclosure policy.